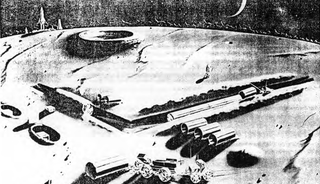 More than 50 years ago, before man had ever stepped foot on the moon, the U.S. government hatched a plan whose ambitions were exceeded only by its total unfeasibility: A secret, self-sustaining, Soviet-shaming military moon base. To be second to the Soviet Union in establishing an outpost on the moon would be disastrous to our nation's prestige and in turn to our democratic philosophy. So to save face and get a better view of its potential target in the process, the United States was determined to set up a permanent residence on the moon. Large lunar environmental simulator for research, development, testing, and training. The program to establish a lunar base must not be delayed and the initial base design must meet military requirements. For example, the base should be designed as a permanent installation, it should be underground, it should strive to be completely self-supporting, and it should provide suitable accommodations to support extended tours of duty. The full study (though a few hundred pages long) is highly entertaining to read and, thankfully, easy enough for the non-rocket scientists among us to understand. But to help, here are the basics of what it takes to make it on the moon. The plan was to initially send a couple of astronauts to scope out the land and settle in. Once reinforcements arrived, construction could start ASAP. Oh, and speaking of that nuclear reactor; they'd have to construct one themselves once they got there. While this all sounds a bit preposterous even by today's standards, the scientists conducting the study knew they weren't quite technologically capable yet—but they did believe it was just a matter of time. Based on present knowledge, the study has concluded that it is technically feasible to establish a manned base on the moon. "Technically feasible" is not meant to imply that the equipments are available, or the techniques are completely known. The goal was to have 12 men living and working on the moon by 1965, just five years after the study was first published. So in addition to planning out the more mechanical logistics, they also had to take the more basic realities of moon life into consideration. Providing food and water alone would be a feat. As far as rations go, each moon man would be allotted three quarts of water per day, which adds up pretty quickly. So to stay as sustainable as possible, any extra bits of moisture in the atmosphere would be "condensed, collected, and used for washing, thus removing the need for an additional quantity. " Plus, any extra water from urine and "washing wastes" could be distilled out. Which, if that twice-used water was deemed potable, the "three quarts per man per day [could] be reduced or eliminated." Good luck, boys. Vegetables for salad may be provided by hydroponic culture, using wastes as nutrients, at least in part, and converting CO2 into O2 in the process, a8 with algae. Ultimately, plant wastes and algae can be used to feed poultry, which thrive in confinement and are, relatively efficient energy converters, producing fresh eggs and meat. Meanwhile, attention will be given to the use of fish and other aquatic animals, such as Daphnia and mollusks, which normally feed on algae. Yes. The United States Army had every intention of putting real, live animals on the moon to be our friends and our food. Now, keeping in mind that we still had yet to actually touch down on the lunar surface, the space suit designs are really just based on some educated guesses about what it would take to function. Fortunately for Neil and Buzz, NASA dumped the ice skate idea by the time it was their turn. Isolation. It would be very desirable to have an area for complete isolation of psychiatric patients and/or communicable disease cases. Specifically, this area will be incorporated in the compartment utilized for the surgical facility and will provide for disposal of excreta, recumbency of the individual and for maximum security. In this latter instance, provisions will be made for a door with exterior locking device, and a window which will automatically close if the pressure in the isolation chamber suddenly decreases. Unfortunately, the U.S. government bit off a bit more than it could chew with this one, and all that research is now nothing more than a fun little blip on the actual timeline to space. We didn't even make it all the way there until two years after the Soviet-crushing moon base was supposed to be up and running. But hey, at least we got there first. You can (and should) head over to The National Security archive to see these plans in full, along with more recently declassified goodies. And if this is what we were planning fifty years ago—god only knows what sorts of interstellar fantasies might be being cooked up as we speak.